#97 Random Act of Kindness – 100 day challenge. Anyway, after putting the last bottle in the machine, I pushed the button to get my ‘money back’ ticket. I put it in my wallet next to my debit card so I wouldn’t forget to give it to the cashier at the checkout, but then I decided I could just leave it on the machine instead, and maybe this little ticket could cheer up someone else’s day. I did keep my eyes open afterwards to see if I could catch a glimpse of who got the ticket, but I never actually saw who it was. I like to imagine that it made him or her smile. Random me: I am sure it made them smile, like winning a little lottery. Kinda wish we got money back for plastic where I live. #96 Random Act of Kindness – 100 day challenge. I know I already sent you my RAK but your blog has inspired me to continue. Yesterday our neighbor three doors down posted on facebook that she hadn’t shoveled her walk yet. They have a plow service for the driveway but not the walkway so the postman will deliver their mail. She has cancer and her husband is in the hospital where they are trying to save his foot. He has been in there since before Christmas. He is a diabetic. They are not elderly but they are a bit reclusive and only through fb do we communicate. I replied that I would be over after work. She posted No she would be fine. I thought about respecting her wishes. I even ran an errand after work but in the end my youngest and I cleared her walkway for her. Hoping we were doing the job to her specifications. When she came home she was delighted. For now instead of shoveling she could take a sub (grinder) to her husband for a dinner treat. It took us 15 minutes, maybe. It would have taken her a lot longer and it would have exhausted her. We will clear her walkway after each storm from now on. Truly how could we not. Random me: I am humbled by the first sentence. #95 Random Act of Kindness – 100 day challenge. A good friend in my Rotary has had serious health issues. He has been homebound for three months now. He can have visitors but is hooked up to machines that are cleaning his blood. My daughter and I drove over to visit him for a few hours. It was very good to see my friend and I know it made his day to have visitors. He said he was so excited that we were coming. He showered and dressed in something other than pajamas for the first time in days. Random me: This is what I’m talking about, this is how we scatter kindness. #94 Random Act of Kindness – 100 day challenge. Be it that every day is a day of giving. Be it big or small. I like buying flowers for a complete stranger, just cause I can. I like giving smiles to every person that passes my way. Random me: This was what I edited out of her response, this is reality, it made me laugh! My dear soul, the wordpress link does not work, though may I wish you all the success for such a beautiful notion. #93 Random Act of Kindness – 100 day challenge. 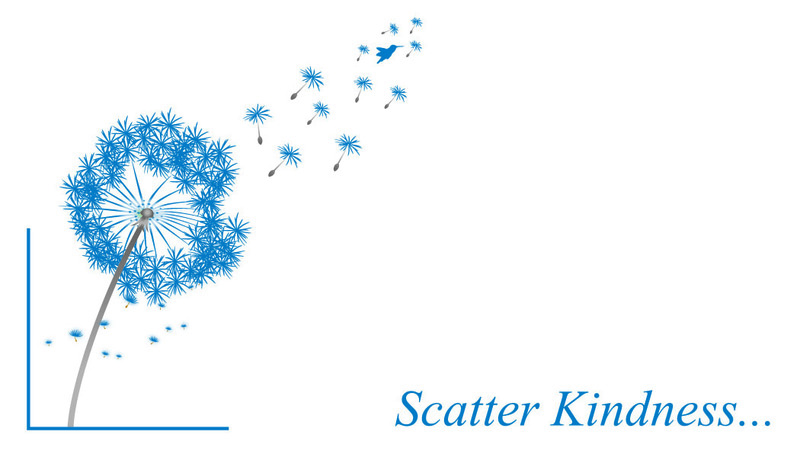 I’ve been meaning to thank you for the great “scatter kindness cards”! They are so beautiful, and I’ve really enjoyed giving them out! I have one more left in my purse! After I gave my first one away to a store clerk, I remember what you said about how some people were like, “Um, are you wanting me to join your cult?” Ha! That store clerk looked at me the same way–kinda suspiciously! Then I quickly said, “I just really appreciate all of the help you gave me today. You went above and beyond to help me (and she had), and it really means a lot. I just wanted to thank you. So since then, I’ve been a little more careful in who I pick to give them to, and try to establish a decent rapport w/ them so they don’t think I’m soliciting them in some weird way! It’s worked out really well! It made me soooo happy to hear that her spirits were lifted… I love doing that kind of thing, and I try to do it when I can–buying someone’s meal anonymously, donating money, taking the kids to help a needy family at Christmas, or going in to our Pediatrician’s office and help pay down a family’s bill that had two sick kids and a parent in the hospital w/ leukemia… It just makes me so happy to do those things for people. Random me: Hummm, scatter kindness cards. Anyone want some? #92 (1/2) Random Act of Kindness – 100 day challenge. A couple days ago we got 9 inches of snow overnight. Random me: Just a side note: This wasn’t in Indiana, it was much farther south where 9″ snowfall is a rarity.